Recently I’ve been going back over some Rawls, and in the course of doing so I came upon Rawls’ views on people with expensive tastes–those whose happiness requires unusually expensive goods. Rawls thinks that people are ultimately responsible for their tastes, having at some point in their lives freely chosen to cultivate them. I don’t think this is true. Here’s why. Equality of Resources–spend the same amount of money on both of us, even though this means my brother will be less happy than me. Equality of Happiness–ensure we are equally happy, even though this means I will receive less resources than my brother. Indeed, I appear to be what’s called a “utility monster”–since I convert resources more efficiently than my brother, if our goal is to generate happiness, it is always more efficient to give me any resources that become available. Many people see this as evidence that utilitarianism is itself wrong. I’d like to take a little detour to discuss that possibility. I have pulled a sleight of hand in this argument–I have assumed that my brother and I always convert resources to utility at the same fixed rates. 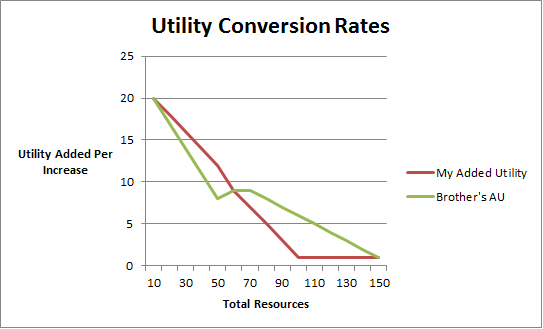 Whether my brother has 0 resources or 100 resources, I have consistently supposed that he converts resources to utility at a 4:3 ratio while I convert at a 2:3 ratio. While my brother has expensive tastes, he does not always express those tastes consistently in the same way. While he loves to fly planes, if his resources were reduced dramatically, he would be forced to find less expensive ways to make himself happy, and, as a result, his conversion ratio would improve. By the same token, as I accrue additional resources, it is reasonable to expect that I will suffer from diminishing returns. My desire to buy books, video games, and Netflix subscriptions is eventually sated–it becomes hard for me to find anything I could spend money on that would make me happy at the same rate as before. In order to convert additional resources to utility I would have to start buying things that I presently consider unreasonable–I might, for instance, buy Chicago Bulls season tickets. In other words, as I receive more resources, I must expand my desires in order to find ways to use them. As my resources increase, my tastes correspondingly become more expensive. My brother’s tastes become expensive more quickly, but given severe poverty or great wealth, either of us can be highly efficient or inefficient. Furthermore, when my brother has access to extremely vast amounts of resources, he’s more efficient than I am, because he knows of many very expensive things that he wants, whereas I do not. So whether or not it makes more sense to give my brother resources or myself from a utilitarian standpoint depends on where we are on the chart and at what rates we are converting. The fact that my brother has expensive tastes does not mean that he is always less efficient regardless of where we are on the chart, it only means that at certain places on the chart he is less efficient than I am and at other places he is more efficient. In the real world, there’s no such thing as a utility monster–we might as well call it the “utility yeti”. But I digress–there’s a more fundamental question at play here. Is it my brother’s fault that he converts resources less efficiently when neither of us has much but more efficiently when we both have quite a bit? Should I be awarded equal resources even in cases in which he can convert them more efficiently? His Environment–because my brother grew up in a reasonably affluent household and had access to more resources than the average kid, he was led to believe that it was reasonable to anticipate having similar resources going forward. In this way he became deluded about his odds of success and so made a foolish bet (albeit one he might yet get lucky and win–he’s a smart kid). Natural Predisposition–I grew up in a reasonably affluent household, but I don’t share my brother’s expensive tastes. It’s possible that my brother has a natural affinity for engineering, technology, and adrenaline-inducing activities, and that this natural inclination led him to have expensive tastes. It’s likely a combination of the two. Without an affluent environment, his natural predispositions would have manifested differently, and without the natural predispositions, his environment was not itself sufficient for the cultivation of expensive tastes. However, both of these categories of reasons seem to rob my brother of his freedom of choice. If my brother’s expensive tastes depend on his environment and/or his natural predispositions, in order for him to be well and truly responsible for them, he must be the author of his environment and/or his natural predispositions. This brings us back to Strawson’s basic argument–a person cannot determine his own decision-making mechanisms, because determining decision-making mechanisms presupposes the existence of already prior decision-making mechanisms. It leads us into an infinite regress. We are not the authors of our own minds; we make none of our decisions freely, and so cannot be causally responsible for any of them. My brother cannot be responsible for the way he is. For that reason, denying him resources that would contribute more to his happiness than they would mine is unnecessarily and unproductively cruel. If we do not want people to have expensive tastes, we should intervene earlier in their lives to ensure they don’t develop them. Once developed, we cannot sit back and blame the individual for sociological and genetic conditions we created and perpetuated.